Smash the follow button for her triumphant first selfie. 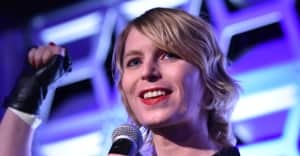 As reported, Chelsea Manning was released from prison on May 17. Her 7 years behind bars were the longest time ever served by an American whistleblower, though her term was thankfully cut short of a planned 45 years after Obama commuted the rest of her sentence this past fall. Chelsea came out as a woman while incarcerated, and fought intensely against the prison system to be treated not just with dignity, but to not be openly abused. That made her a trans icon, but until now only a single photo of her with long hair and makeup has circulated, taken before she was arrested. The first selfie, probably more so than any selfie ever before, is a freaking triumph.